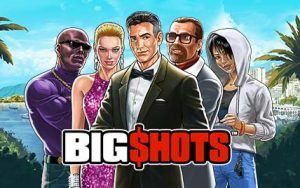 Join the Riviera high rollers in Big Shots, a luxury-themed slot game from Playtech. It’s a 6 reel, 4,096 ways to win game that comes with oversized symbols that can reach up to 4x4 square. There’s also a bonus round that awards up to 10 free spins with all of the lower value symbols removed. Play this highly volatile game on your PC, tablet or mobile from between 20p and £6 per spin. The design in Big Shots is done comic book style. With a beautiful harbour in the background, you’ll see playing card suit symbols alongside a cast of 5 higher value character symbols. The girl in the hoodie and the black guy in shades both pay up to 2.5 times your stake per combination. Next comes the older man with glasses and goatee and the blonde woman who award up to 3.75 times your stake. The best of the standard symbols is the man in the tux. Land 6 of him on adjacent reels and you’ll receive payout of 5 times your stake. The diamond is the wild. It substitutes for all other symbols bar the free spins scatter and offers payout of 6.25 times your stake if you land 5 on a payline. Those payouts might not sound particularly large. You won’t just see single symbols spinning around the reels though. They can appear in colossal formations of anything up to 4x4 square which can create some potentially massive winning clusters. Fill the whole of reels 2 through 5 with the colossal Free Spins symbol to trigger the Free Games feature - on offer here are 5 free spins. All of the lower value playing card suit symbols are removed from the reels throughout this round. Retriggers are possible here too meaning up to 10 free spins in total. Big Shots is a simple game. It’s an explosive one though. The volatility here is very high so you can expect times when your bankroll will disappear like a losing run at the Monte Carlo Casino. It is possible to win big quickly though. In theory, you could win a massive 25,600 times your stake if you fill all positions on the reels with wilds. This trip to the Riviera is a stripped back but enjoyable one. The visuals are well done and there’s a real Ocean’s 11 feel to the soundtrack. If you can cope with the potentially big swings, then there’s plenty to like about these Big Shots. There are many 6 reels, 4,096 ways to win slot games out there but Raging Rex from Play ‘N Go is my pick.